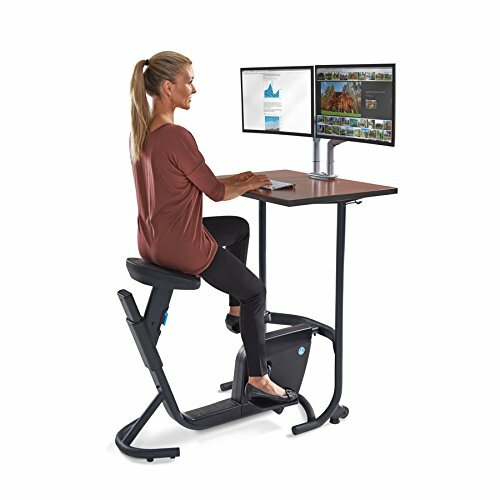 The LifeSpan Unity bike desk combines the health benefits of cycling with the efficiency of a traditional desk, converting sedentary time into productive exercise. As easy as riding a bike, the Unity desk delivers greater overall health and enhanced mental stimulation all the way through traditionally idle activities, including homework and Take a look at hours, screen time, and place of work work. Fitted to any setting, the desk’s power-free operation, silent pedaling, and spacious cherry-grain desktop provide easy, focused activity to your own home, lecture room, or place of work. No batteries to interchange or power cords to stumble over since the Unity is powered by you. Simply place the bike anywhere you could place a traditional chair and get started gaining some great benefits of exercise at the same time as you pedal at your desk. The Unity is definitely integrated into your own home, lecture room, or workspace. Outfitted with a comfortable, oversized seat, functional features, and 7 inches of adjustable seat height, the Unity is absolute best for college kids, professionals, and for the entire circle of relatives. Warranty covers three years at the frame and one year on parts.